The idea for the program came when two high school students, Hugo Bogdan (Year 11) and Emilie Page (Year 12), made us aware of the difficulties that they and their peers have accessing meaningful work experience and mentors. These difficulties were a genuine insight into the reality of studying medicine and working in health care.A collaboration between the two students, RMH staff members, Dr Vanessa Morgan (RMH Dermatologist), Catherine Carbery (Director Simulation Centre) and Dr Catherine Seymour (Sub-Dean RMH Clinical School) saw the development of the Med-e-Sim program. 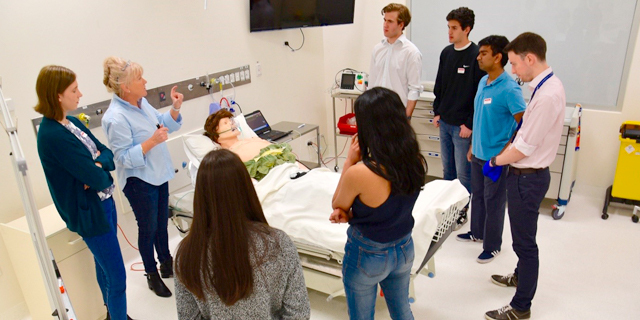 Twenty-Four Year 11 and 12 students interested in pursuing careers in medicine participated in the program which began with tours of the Emergency Department and Intensive Care Unit led by senior medical staff. Small groups of students then rotated through four simulation stations - IV cannulation, suturing, basic life support and a simulation based scenario of a deteriorating patient, under the expert supervision of staff. The program concluded with a panel discussion involving current RMH student doctors, junior doctors, clinical nurse educators, senior consultants and Clinical School staff sharing their experiences and giving the students the opportunity to ask questions. “I have always liked the idea of a career in Medicine, but have been unsure of what it really entails. This is why I found the Med-e-Sim workshop so valuable. I was exposed to real life situations, heard from Medical professionals and students and was able to gain some experience.” - Ishka (Year 12). “I had an incredible day at the Med-e-Sim workshop. Being able to see so many different areas of the hospital, speak to Doctors from varied fields and experience what it is like to be a working Doctor has really helped to cement my decision to pursue medicine as a career in the future. All the staff involved in the program were friendly and generous with their time, always happy to share their story of how they got where they are today and what their career really entails. After my experience at Med-e-Sim I really think that I have a better understanding of what being a doctor is all about and I am excited to continue my journey to become one myself.” - Bryley (Year 12). We would like to acknowledge the generous contributions of the Simulation Centre staff, RMH Emergency Department and Intensive Care Unit for welcoming the students, as well as all the University of Melbourne RMH Clinical School staff and students that gave freely of their time and expertise on a Saturday. This project highlights the successful cross collaboration between hospital departments and the University of Melbourne. Following the success of the pilot, we plan to develop this program for students at high schools in the Royal Melbourne Hospital and University of Melbourne catchment areas. These young adults are key stakeholders for both institutions, and this program helps not only with engagement and connections, but also assists with making astute and insightful career decisions. We believe that it also serves to strengthen our vital inter-institutional relationship and links with the local community. We are actively seeking funding to support this initiative. Please contact Dr Catherine Seymour - seymour@unimelb.edu.au if you can be of assistance.